Shoes with heels – the men get it too! 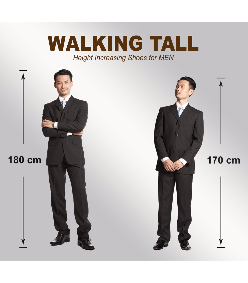 Men (their girlfriends, wives, sisters and even mothers) have gone shopping at Walking Tall to grab their shoes, which can make them taller instantly by as much as 10cm. Started in 2006, Walking Tall specializes in men’s height increasing shoes. It comes with unique built-in insoles that help to discreetly boost one’s height by 6 to 10cm. Made of genuine calf leather, the shoes are stylish, comfortable and durable. Our boutique offers a wide collection of over 80 designs for both business and casual occasions from classic lace up to sporty slip on. Men can now easily find a design whenever they need an extra bit of height, better posture and confidence!